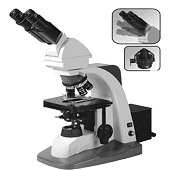 The SK1000EB & SK1000ET research microscopess are loaded with the most popular features, including a swing in-out condenser and inclined adjustment 0-40 degree viewing head. This scope is built on a heavy, durable frame. Standard features include: 10X/22 High Eyepoint eyepiece, reverse nosepiece for easy access to the stage, and 110/220V automatic switching electronics. The scope can also be equipped with a number of optional accessories including: Polarization, Phase Contrast, Trinocular head, Fluorescent attachment. 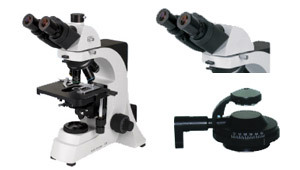 The SK500EB & SK500ET research microscopess are loaded with the most popular features, including a swing in-out condenser and a powerful 100X objective (oil). This scope is built on a heavy, durable frame. Standard features include: 10X/22 High Eyepoint eyepiece, reverse nosepiece for easy access to the stage, and 110/220V automatic switching electronics. The scope can also be equipped with a number of optional accessories including: Polarization, Phase Contrast, Trinocular head, and a number of different objectives. Trinocular, Mirror, Simple Polarizer,Phase Contrast turret, 100x Darkfield Condenser Quintuple nosepiece, Digital camera adaptor etc.